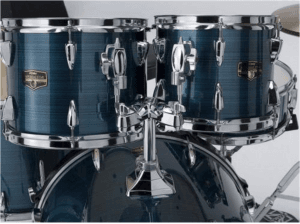 Tama Imperialstar Review: Will it Cover Your Drumming Needs? Tama is known for making some of the best sounding drum kits in the business and any modern-day great drummers such as Anika Nilles and Robert Searight (look them up!) swear by Tama. Now, the Imperialstar is Tama’s entry-level acoustic drum kit and is also one of their cheapest drum kits. 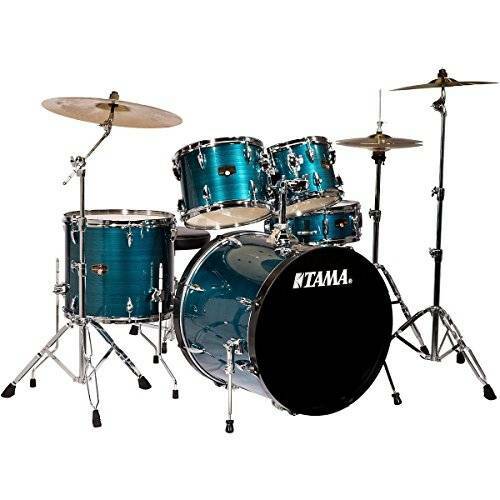 Which begs the question: Is the Tama Imperialstar a suitable drum kit for students and performers alike? Will it last long? What is it made of? Is it worth your money? You’ll find out right now in this Tama Imperialstar review. If you buy the Tama Imperialstar through Amazon, you will get more than just the drums. It will come with cymbals and hardware too! Once you order it, you will receive a box of about 46 x 46 x 50 inches that weighs around 75 pounds. The Tama Imperialstar comes packed with many things that are great for any drummer. It has a hairline blue finish which will look great under stage lighting and also make you want to practice on that kit at home. The shells are made of poplar and have “precision-crafted bearing edges” which basically means that the metal rings around the shells have been made to withstand heavy beatings from drummers. Having poplar shells means that the sound quality of the kit won’t be as good as a maple or birch kit. But that is why this kit falls under the entry-level category. Also, poplar gives a bright and focused tone which some people like, but there are some who prefer a different tone. The toms have a warm sound and decent sustain, but they aren’t crystal clear. The bass drum has a big booming sound which can be controlled by putting some padding inside the bass drum. The highlight of the Imperialstar has to be the snare drum! It has a sharp, attacking sound. It is dark, but it comes to life when you play rim shots and cross-clicks. The sound quality of the snare drum seems to be much higher than its “entry-level” status. Unfortunately, the stock drum heads that come with the kit do sound like they are part of an entry-level kit. But that can easily be fixed by getting good quality heads and tuning them up. This is the case with all entry-level drum kits anyway. I can personally say that when I played on this kit at a gig, I got it to sound great with good tuning. Check out this Tama Imperialstar review video and notice how good that snare drum sounds! The Imperialstar comes with Tama’s “Stagemaster” hardware. The stands are double-braced. This means that the legs of the stand have two supporting metal beams. This makes the stand a lot more sturdier and enables them to take a pounding! Double-braced hardware is great to see on an entry-level kit. The best pieces of hardware that you get are the hihat stand and the bass drum pedal. 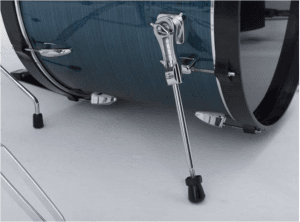 The hihat stand has a 360-degree rotating pedal. This means you can place the stand wherever you want it without the legs getting in the way. This is very important as you have to be comfortable when playing the drums! The bass drum pedal has a metal base. This is something that every single high quality bass drum pedal has. It creates stability for your bass drum and any drummer will argue that it makes your playing better! The snare drum that comes with the Tama Imperialstar package is just superb! The snare drum is the drum you hit most on a drum kit, so it is extremely important that you like the sound that your snare drum makes. If you use this snare drum, you definitely won’t be disappointed! The double-braced hardware that comes with the set will allow you to bash the cymbals as hard as you can without the stands moving around. The bass drum pedal has a metal base. This is not common in entry-level drum kits. 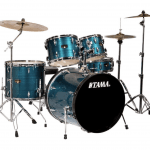 Tama drum kits are known to last VERY long. The drum kit is quite cheap considering everything that comes with it. The Tama Imperialstar has Tama’s “omni-sphere” tom mounting system. The system makes it a bit awkward if you like to position your toms exactly how you like them. This is not such a big issue for beginners. Intermediate to advanced players will be frustrated by this though as they will be used to having their toms in a certain position. The stock heads that come with the kit are not that great. It is possible to tune them to sound somewhat okay. But you’d be much better off if you bought a new set of good drum heads for the kit. Do the cymbals and the stands come with the kit? Yes they do! The Tama Imperialstar comes with Meinl HCS cymbals that include a pair of 14 inch hihats, a 16 inch crash cymbal, and a 20 inch ride cymbal. It also comes with a hihat stand, a straight cymbal stand and a boom cymbal stand. Last but not least, you get a drum throne and an Iron Cobra bass drum pedal. Once you get this kit, you will be ready to play without needing to buy anything else! Does it come with a drum key and a bass drum patch? It does come with a drum key. The drum key will allow you to tune the drums. If you don’t know how to tune drums, a quick YouTube tutorial will can help you. It does not come with a bass drum patch. A bass drum patch is a small piece of padding that drummers sometimes put on the bass drum head to prevent it from wearing and tearing. Do the cymbals sound good? The Pearl Export and the Tama Imperialstar are both made with poplar shells. This means that the sounds that their toms make are very similar. But, in my opinion, the snare drum from the Imperialstar sounds a lot better than the Export’s snare. The biggest difference between the two kits is the hardware. I have personally been using Export series hardware for over 10 years and it has never showed any signs of breaking! The Imperialstar comes with Tama’s “Stagemaster” hardware and the Export comes with Pearl’s famous Export Hardware. Although the Stagemaster cymbal stands are also double-braced, the Export cymbal stands are much sturdier and therefore better. The Tama Imperialstar comes with the Tama HP200P Iron Cobra bass drum pedal and the Pearl Export comes with the Pearl Demonator P-930. They are both great bass drum pedals but the Pearl Demonator is the winner in this battle. Both the tom mounting systems from the Imperialstar and the Export are not that great. I have had many frustrating moments in the past where I just couldn’t get the toms where I wanted on the Export. The Imperialstar has a little bit more maneuverability in its tom mount system. The Tama Imperialstar comes with cymbals whereas the Pearl Export doesn’t. This means that if you buy the Export then you’ll have to buy cymbals as well, making the Imperialstar the cheaper option. 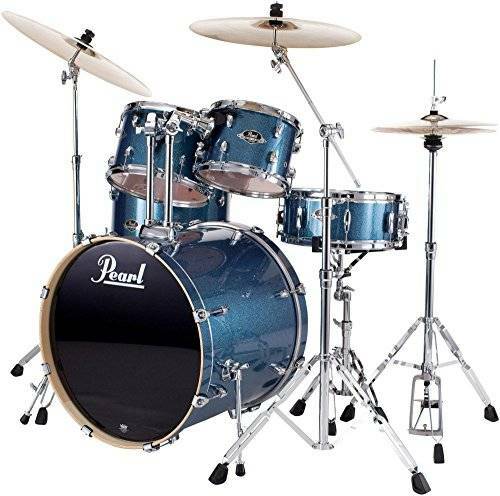 But if you are looking for something with much sturdier hardware, the Pearl Export can be a good option for you. Overall, the Tama Imperialstar is a great kit for beginners. It comes with everything a starting out drummer needs at a very affordable price. If there are certain things that you don’t like, for example the sound of the toms, you can easily just buy better drum heads! The hardware is great and the Iron Cobra bass drum pedal is a lovely addition to this kit. I would recommend this kit to anyone who is a beginner that needs a drum set. I would also buy it for myself if I needed a second drum kit to use in my private drumming lessons. The reason for this is because it is very affordable and it comes with drums, cymbals, and hardware all in one package. And the best thing is: you don’t have to take my word for it. Take Randy’s – who’s been playing the Imperialstar too. Do you have a question about my Tama Imperialstar Review? Let me know in the comments and I’ll get back to you within 48 hours. Or have you bought the kit already and care to share your experience? You’d do the readers here a huge favor. And I read and respond to every single comment too. So I’d love to hear from you! The tama imperial star has a accu tune plastic bass drum hoops and the pearl export has a wood hoop just like some high end drums , what is the difference beetween them ? Because I am planning to buy a new drum but this wood hoop , accu tune plastic thing is getting in my head , please help me . Thanks for your question. You’re right there, but I honestly don’t think one would be able to tell the difference just by listening and without knowing about it (unless, perhaps, one has spent years developing ones ears and is a veritable drum sound afficionado). I think there are so many other factors that shape the sound of your drum set – and I think the one that you can control and also has the largest influence are the kinds of heads you buy and the way you tune them. Does this kit come with a throne? Yes, the Tama Imperialstar does come with a throne. Wait, the Imperialstar does come with a drum throne. Thanks for pointing that out. Within the article I said so myself, but I must have made mistake answering that one comment. I’ve changed it now. Thank you! Cool thing you picked up an Imperialstar! Actually, I recommend buying new battery heads first and evaluating the improvement before buying new resos too. They will only cost you more money and time tuning and in my experience batter heads mostly do the trick on their own. For more information see my drum heads guide here. All in all this is a great set that with personal tweaking will rival anything our there. Gig wise it’s a workhorse. Cant fo wrong. Yamaha stage custom will be my next kit because I like birch, but the Superstar Tama is also on my mind. Tama drums great value for your money. I have the Imperialstar and I played for 30 yrs, mostly semi- pro , weekend warrior. I left the music scene and sold my pro gear. I wanted something cheap, yet looked and sounded good, with sturdy hardware. Had I not needed cymbals I would of chosen the Export, because the Mahagony and poplar are better shells. When I made my decision based on value, Tama won. The drums were well built for the price. 30yrs ago this would be considered a pro kit by the way. The bass drum is the best drum of the bunch. The extra depth gives it great punch. The 12 inch tom gives the best sound, of all the Tom’s. For some reason the 10in doesn’t do it for me, but that’s my issue, I like standard 8×12 and 9×13, which you have to special order anymore. The snare was garbage, sorry, I hated it. I would suggest getting an old Ludwig Acrolite, or a black beauty. The floor tom has sturdy legs, and all the hardware is great. Bass pedal is awesome, as good as a DW in its class. As for the heads, I suggest you get some Evan’s or Remo. I chose vintage coated emperors. And put an ambassador on the 10 to give it some sustain. I use the remo rings to place over the snare and Tom’s and I have got a great sound out of them. Poplar has a lot of Birch quality, but less attack and punch, but none the less this set sounds like a 2500 kit. I’m going to get maple hoops for the fact that maple on black would look sharp with gold plated tension rods and claws. The cymbals are low end but the Ride and hats are gig worthy. Seriously great little cymbals, for free. The crash needs thrown under a bus, but hey better than nothing. I since traded up to Paiste pst7, which are awesome, for any level. Thanks so much for sharing this, I think this will be amazing for everyone else reading this review. I really appreciate it! Just to let you know: I’ve added line breaks to your detailled text and moved the overall verdict to the top, so it’s easier for people to read. And I threw in some links where I though they would be helpful. I hope you don’t mind. Thank you very much – and I will link to your comment from within the article. The bearing edge has nothing to do with the hoops, The bearing edge—the bevelled rim of a drum’s shell—is the only place where the head meets the body of the drum. When you strike the skin, the energy of your stick transfers from the head through the edge to the shell. The angle and shape of the edge’s cut determines the amount of contact between the head and the shell, contributing greatly to the resonance and tone of the drum. They also determine the direction of the shell’s resonance, with rounder edges making a shell vibrate outward from the core and sharper edges drawing vibrations inward from the outer wall. All drums, whether they are entry level or DW have issues with this critical component of how your drums will sound, due to them being manufactured in large numbers the bearing edges of all new drums should be checked, leveled if needed and then have bearing edges re-done, this can make an entry level kit sound like a top of the line kit for about 25 bucks an edge, my Gretsch Maple kit sounds 200% better since i had them done, more punch and tone and in the case of the snare much more attack. Thank you so much for this input. I’m sure it will be valuable to any reader of this article.